This PDF 1.6 document has been generated by Acrobat PDFMaker 11 for Word / Adobe PDF Library 11.0, and has been sent on pdf-archive.com on 04/06/2017 at 21:40, from IP address 96.8.x.x. The current document download page has been viewed 325 times. File size: 17.6 MB (29 pages). 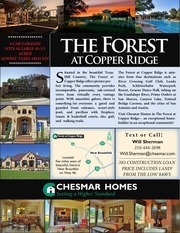 Copper Ridge— an exceptional homebuilder in an exceptional community! 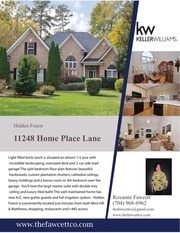 model home for at or near the base price of the home. everything simple so its easy to see we offer more. home...you have to buy the home first! Let us show you how Chesmar is different. SETTING A HIGHER STANDARD in New Braunfels! TAXES: (2016) Comal County Appraisal Dist. *5/28/17 Information may change without notice. 3/8’ Carpet cushion 5 lbs. Separate shower with ceramic tile surround. Rainier | 2,441 Sq. ft.
Adelaide | 2,856 Sq. ft.
Sierra | 2,957 Sq. ft.
Calvary | 3,164 Sq. ft.
Olympus | 3,027 Sq. ft.
Brisbane | 3,656 Sq. ft.
Whitney | 3,722 Sq. ft.
Titan | 3,982 Sq. ft.
Loop N, then TX-46 E to Copper Trace. porches may also vary by elevation. Plans, features, prices and availability are subject to change without notice. This file has been shared by a user of PDF Archive. Document ID: 00607027.